It's been several years or more since the last major update to the Chester NH baseball website. 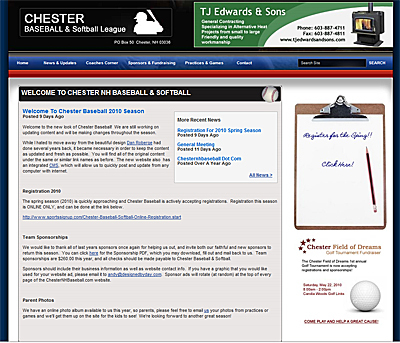 Local web designer Dan Roberge had created a place for the Chester baseball and softball leagues to post announcements and information, and as more and more information was moving from paper to web, it became that much more important to make the website easy to update. The new website has a simple straight forward design, but is now powered by the latest version of the designed by day content management system. Before, web pages were static HTML, and required downloading, updating and then re-uploading... now content can be changed on the fly, from any computer with an internet connection. Registration is taking place now for Chester kids! For more information, visit www.chesternhbaseball.com!